We hiked all the way out to the Hidden Draw area in Woodfords yesterday in the hottest conditions ever. The exposed 45 minutes walk in the 90 degree heat felt like a little slice of hell as Brenna Fischer marched out on a mission to send her first v5 boulder problem. Despite bad conditions and a tweaked ankle Brenna was confident that the send would be imminant. And after warming up on the finishing moves she sent the problem rather quickly and we bolted right back out to escape the intense heat. While some people may feel this is not a ground-breaking event, we all know what it feels like when you hit a new high point in your climbing. Each step is more exciting and intense than the last. We can only really get that feeling a maximum of 15 times before we die, so each and every one is rather special to us. Congratulations to Brenna on breaking a new personal barrier. She will probably want to do a lot more v5s now and v6 is not that far off. Good Job. Yesterday Noah Kaufman, Brian Arnold, and many others did a session at Crater Lake where old problems became more clarified and new first ascents and repeats went down. Noah Kaufman sent the F.A. of Lactose Intolerance v10. This new climb is awesome and is a must do for anyone who is sick enough to pull it off. Brian and Noah also pulled off the 2nd and 3rd ascent of Dangerously Cheesy v11 which actually goes up the right arete from a sit-start. There feelings were that this is likely soft for the grade but keep in mind that both these monsters regularly crush problems of this grade so maybe they just don't know there own strength. But either way this thing saw some more sends. I thought I was doing this line's 2nd ascent the other day but it turns out that I was actually doing a new F.A. on the boulder that is probably the hardest line done so far. I named it Milk Money and I'm calling it v12 . 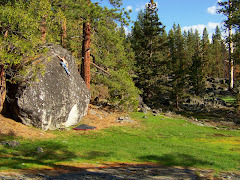 Other notable ascents were David Oltcult doing the right line v7 and Frank Lucido sent the right arete v6/7. The continued traffic on this boulder is confirmation to its quality and for all who haven't seen or heard you need to go get some.